Every year there is several serious boating accidents where the driver falls overboard and the kill cord has not been used. If you fall overboard there is a great risk that the boat automatically turns and you get run over, or it continues straight ahead while maintaining speed. 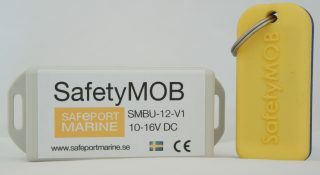 The SafetyMOB system consists of a helm unit attached to the life jacket or the driver and a boat unit that is mounted in the boat. The helm unit communicates constantly with the boat unit which is connected to the boat’s existing emergency stop, if you fall overboard the communication is interrupted and the engine stops. After the system is triggered for man overboard, the engine can be restarted by switching off the SafetyMOB system and after that start the engine as usual. If you have forgotten to bring the helm unit you can run the boat as usual, the system is not activated until a helm unit are in close proximity to the boat unit on startup. 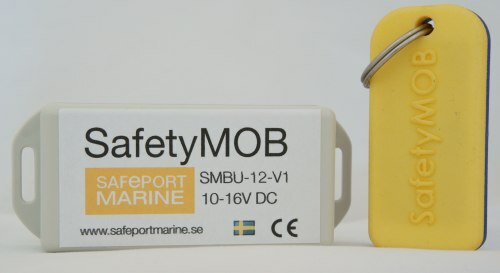 The SafetyMOB system works on both outboard and inboard engines, gasoline and diesels with electronic stop. Price SafetyMOB – DMG: 1895:- incl. VAT. Installing a SafetyMOB central unit is relatively easy and can be performed by “DIY”. The boat unit´s cabling for emergency stop is connected in parallel or in series with the existing emergency stop. The boat’s existing emergency stop will continue to function as normal. It is possible to connect an indicator light showing the current state of the system. It is also possible to connect an external relay to for instance stop an electric motor (trolling motor). The boat unit is preferably mounted close to the steering wheel so that the distance to the driver is minimized, this makes the system less sensitive to radio interference. If you lose your helm unit you can buy a new one and register it to the system.